Dmitry Kiselyov's Sunday-night TV program is one of the most influential sources of news in Russia. And last weekend, the Kremlin-friendly broadcaster focused his ire on Ukrainians living in Canada. Dmitry Kiselyov has a unique distinction among Russian broadcasters. 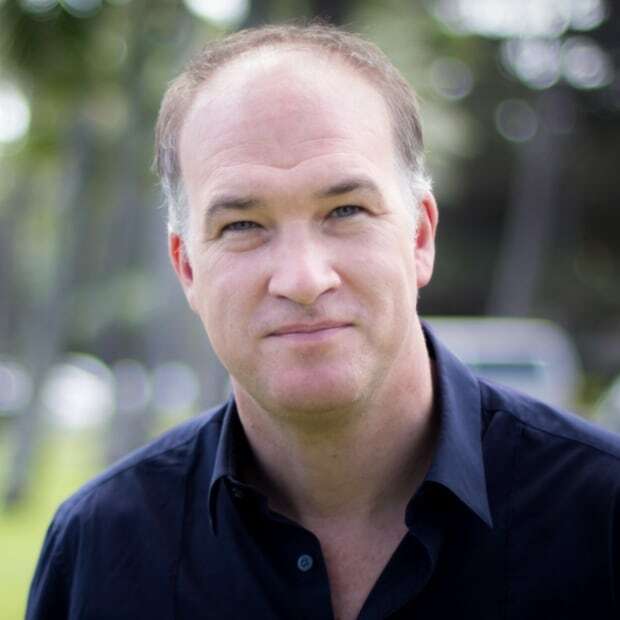 He's the only Russian media personality among the 93 individuals named on Canada's economic sanctions list, which targets Russians the Canadian government believes are engaging in "activities related to the violation of the sovereignty of Ukraine." Kiselyov is hardly the only broadcaster spinning the Kremlin's political line, but he is seen as one of its most effective messengers. A recent poll by the independent Levada Center ranked him and his prime-time Sunday night program, Vesti Nedeli (News of the Week), as one of the most influential sources of news in the country. And last Sunday, Kiselyov turned his sights on Canada. Russia's embassy in Ottawa has waged an aggressive campaign on Twitter, suggesting Canada is harbouring Ukrainian fascists who are directing anti-Russian policies by the Canadian government. But a full, prime-time treatment by one of Russia's most recognizable figures seems to represent an escalation in the country's propaganda efforts directed against Canada. The program took Russian viewers to what appeared to be St. Volodymyr Ukrainian Cemetery in Oakville, Ont. The cemetery contains the graves of soldiers of, and monuments to, Ukraine's Galician Division. Its soldiers fought alongside the German Waffen-SS and against the Soviets during the Second World War. "[The Galician Division] was declared a criminal group," intoned the show's voiceover, yet the Canadian government did nothing and refused to prosecute any of its members. The report went on to imply that it is the descendents of the Galician Division — Ukrainian nationalists — who dominate politics in Canada today. According to one Russian-speaking woman interviewed in the story, the Ukrainian Canadian Congress, the diaspora's most prominent lobby group, "have the power" to "dictate Canadian foreign policy." 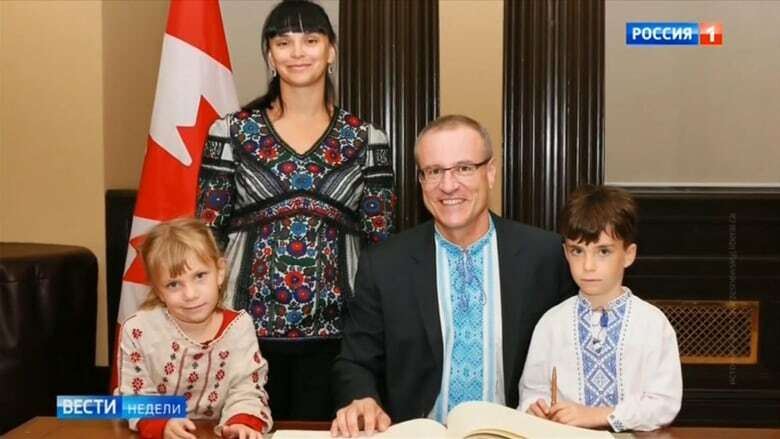 The program went on to show Canadian Foreign Affairs Minister Chrystia Freeland and Liberal MP Borys Wrzesnewskyj dressed in their traditional Ukrainian vyshyvankas, singing together with Prime Minister Justin Trudeau outside the House of Commons in Ottawa. 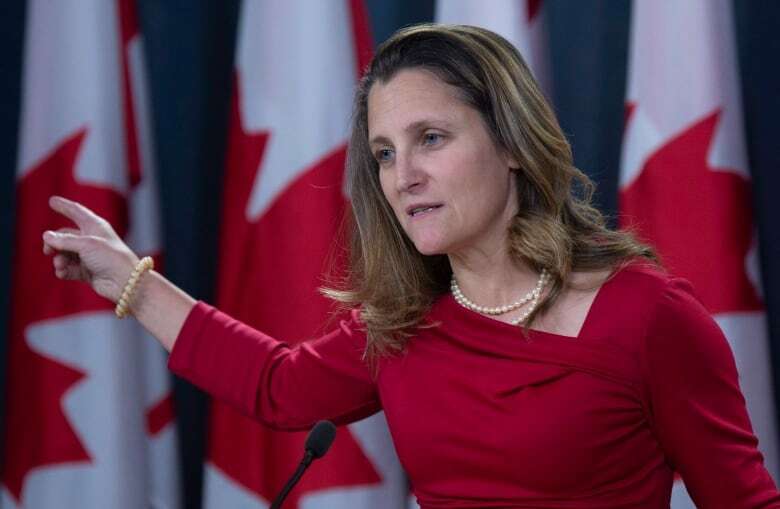 Freeland, in particular, has been the subject of repeated stories in the Russian media about her maternal grandfather's wartime role as the editor of a Nazi newspaper. The suggestion is that Freeland's family background is part of what motivates her and Canada's government to oppose Russia. The role of anti-Stalin militias that fought alongside the Germans during the Second World War remains a contentious issue in Ukraine. During the 2014 Euromaidan demonstrations, which culminated in the removal of Ukraine's pro-Russia President Viktor Yanukovych, protest leaders often invoked the names of the militia leaders as inspiration. The presence of far-right militias, which have been engaged in the fight against Russian-backed separatists in Eastern Ukraine, has also posed a problem for Ukraine's supporters in the west. Many of the groups are openly anti-immigrant and wear fascist symbols. The Russian TV program didn't explicitly state that all Ukrainian Canadians alive in Canada today are Nazi sympathizers — but it doesn't need to in order to create the desired effect. To a Russian audience, the juxtaposition of the cemetery monuments with the Ukrainian vyshyvankas is enough to make the association. "It's just ludicrous," Wrzesnewskyj told CBC News. "There is nothing sinister in respecting one's ancestry and culture. "For any Russian watching the program, it's not about any kind of in-depth analysis or understanding — it's about trying to create fear and hatred." Inside a former Russian spy's info wars course. Today's lesson — the nerve agent poisonings in the U.K.
A new report by Canada's Macdonald-Laurier Institute, to be released today, examines Russian propaganda efforts aimed at Canada and underscores the Kremlin's reliance on Second World War imagery. "The Putin regime is so desperate to find fascist enemies that it is willing to create them if necessary," said the report. In 1985, under pressure from Jewish groups who believed Canada had become a safe haven for Nazi war criminals, the government of Brian Mulroney established a Royal Commission. As part of its mandate, it looked into the status of ex-members of the Ukrainian Galician Division. Its final report concluded members of the division should not be indicted as a group for their association with the Waffen-SS, and that no war crime charges against any individual members could be substantiated. The Russian report noted that Ukrainian-Canadians have held senior positions in the Canadian cabinets of Liberal and Conservative governments, and a number of Canadian premiers have also come from a Ukrainian background - all of which is true. But Wrzesnewskyj said the Russian propaganda makes it appear as something insidious, that Ukrainians are "taking over the government." The prominence of Canadian politicians of Ukrainian descent just reflects " the nature of our multicultural society," said Wrzesnewskyj. 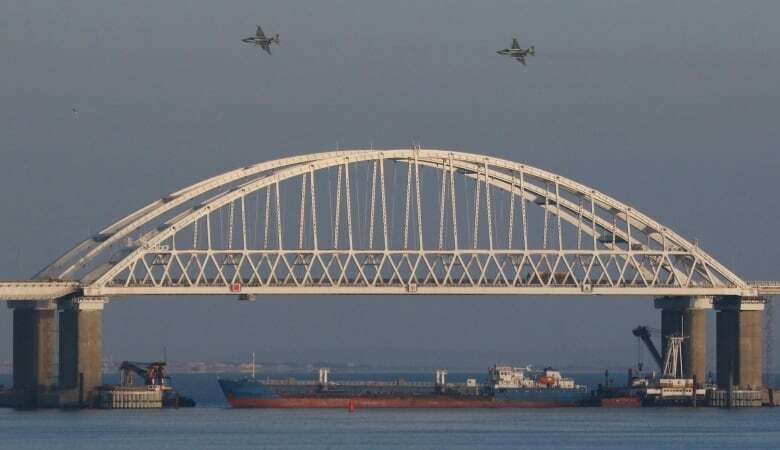 There's been a ramping up of anti-Ukrainian propaganda on Russian state TV since November, when Russia's navy fired on and captured three Ukrainian warships as they were trying to transit under Russia's new bridge across the Kerch Strait. As part of its annexation of Crimea, Russia claims the waters under the bridge that lead from the Black Sea into the Azov Sea as part of its territory — something Ukraine rejects. The ships' crew of 24 Ukrainian sailors have been held in Russian jails since the end of November and could face prison sentences of up to six years. The Ukrainian government refers to the men as "hostages." Russian propaganda has been portraying the Ukrainians as instigators and has been warning of a potential military threat to the separatist areas of Eastern Ukraine, where Russia has been supporting an insurgency since 2014. Ukraine's information ministry says it is bombarded by a constant stream of online propaganda and fake news originating in Russia that's aimed at denigrating the pro-Western government of Poroshenko. Much of it claims Ukraine is a failed state and dominated by neo-Nazi groups. 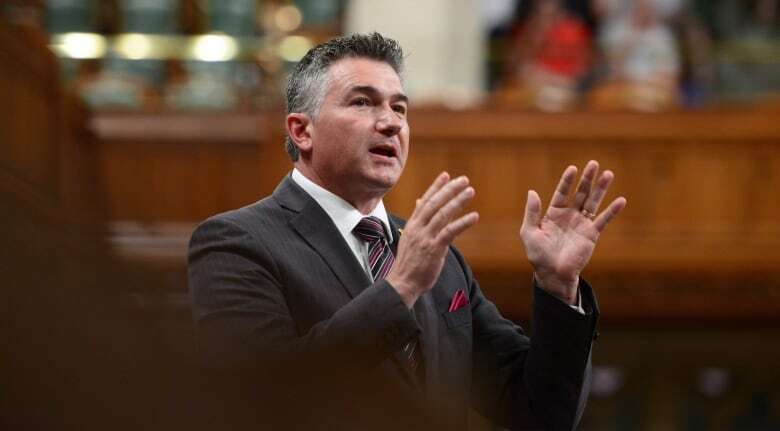 James Bezan, a Conservative MP who was also singled out in the Russian TV program for his Ukrainian roots, said such propaganda efforts are part of a larger Russian strategy to weaken and destabilize Ukraine and its relationship with allies. "It is through their own misinformation campaigns that they will continue to nibble away at the sovereign territory of Ukraine until it's too late to do anything," Bezan told CBC News. He said Ukraine has a deep economic relationship with Russia that he hopes can continue. "But we have to make sure the relationship is healthy and based upon mutual respect."